Which Guardian of the Galaxy might be heading to Jurassic World? Almost Human is thinking about robo-rights. 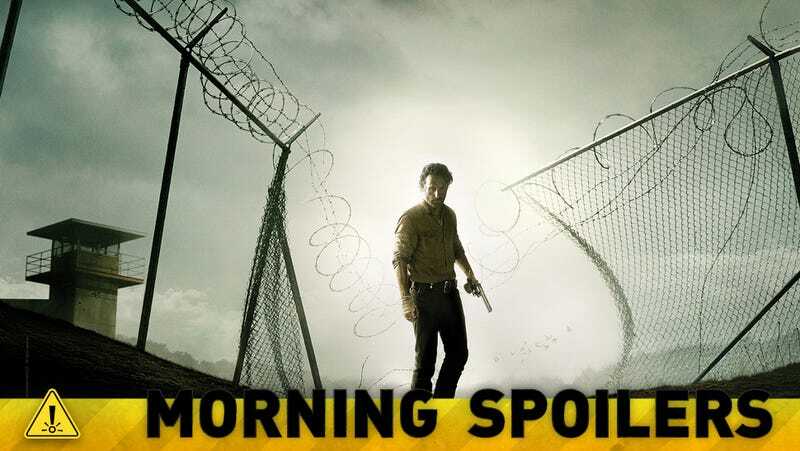 There are new pictures of the Governor from Sunday's Walking Dead. Monroe's parents have been cast in Grimm. And we finally know who Stevie Nicks will be playing on American Horror Story. Spoilers ahead! It's a completely different stand-alone movie. It takes place after the third one, after the battle of Chicago. It's definitely its own story. I think it's very different and fresh and people are going to really enjoy it. I had a blast making it. And you're going to see things in this particular movie that you haven't seen in the other movies. Yes. Originally we conceived her as a man, the concept of Maldonado. Somebody had brought up, I'm not sure, I think it was April Webster, our casting director, that said ,"What about Lili Taylor?" Then once we started talking about, we are huge fans of hers, that concept we realized that the character of Maldonado would actually be far superior if it was a woman. The character started to take on all these incredible aspects that really weren't there in a male version of her. We just embraced the idea and we're so fortunate to get her because we just all really adore her. That's how that came about. It wasn't originally designed as a female, but we went down that road when it was presented and we loved it. With Civil Rights being such a big issue right now, are there going to be robot rights, maybe robot marriage explored on the show? That's a really good question. J.J. had set us up with some very, very brilliant people from MIT, and one of the brilliant people was a woman who studies robot ethics, which is pretty amazing because when you talk to her, you get the idea that, wait a second, this is definitely coming. Some of the amazing things with these robots that are now what we see in the future are definitely robots, not human. They're not becoming human, but they're definitely becoming beings. That's a moment where you're thinking, they're real. They are thinking beings. What are their rights? Where are those lines drawn? A lot of those things are examined in some of our later stories. Those concepts of what exactly is a robot? What is an android? What is a being? If it's able to think, if it's able to be, then what? We're definitely interested in those types of things. We had a bunch of tactical training. I went on a bunch of ride-alongs with some cops just to get a sort of feel of what the reality is of their job. Then there's also a physical component. Our show is a fun, action-packed hour of television. Michael and I both need to be in good shape to do our job. So I think right now the hardest part is actually trying to understand and develop somewhat of a bible for the world that we live in. You know what I mean. So it's like, can you talk on the phone or do you talk through your com? So it's like we're trying to find out what are the rules of the world that we set up. I think that's probably the hardest part for me right now. Well, in the next episode the character appears in, there's going to be a big plot twist. What you've seen so far is just the tip of the iceberg. I had a wonderful time in this last episode. I really like where they're taking it. They're still working on things in the writer's room and deciding exactly what they're going to do, but I think the audience is going to like the twist in Isabel's plot. Andrew won't tell me much more! [Laughs] But it's going to be a lot of fun. It's part of Fiona's ruse in that Fiona is trying to get the true Supreme to reveal herself because she needs to stay alive. So she tells Misty Day that the Supreme gets so many great things in life, like tickets to the Oscars and Met Ball tickets. So she brings Stevie Nicks in as a gift to Misty to prove to her that if she exhibits more power she'll get that and more. Then the other girls come home and see Stevie and Misty singing and it starts them trying to move much quicker to prove that they are the Supreme. HIDDEN SECRETS —- Stephen (Robbie Amell) is determined to uncover what he hopes is the key to finding his father, and crafts a plan with the Tomorrow People that involves getting inside Jedikiah's (Mark Pellegrino) head. Meanwhile, Cara (Peyton List) and Russell (Aaron Yoo) encounter an uninvited visitor in the subway tunnel base. Stephen takes a risky opportunity and snoops around Ultra. Luke Mitchell also stars. Rob Bailey directed the story by Greg Berlanti and Phil Klemmer and teleplay by Phil Klemmer and Alex Katsnelson (#108). [Maybe] a little bit, but not really… That triangle is, to be honest, a bit on the backburner right now. It's the elephant in the room. When you're in a relationship and there's an ex-boyfriend around, the significant other is always like, 'Hmm, I wonder…' There's always that insecurity. They might say that it's OK, but it's in the back of their mind. It's the same thing with Elena and Damon. He's pretending to be OK with it, but he can't unthink and unknow what he heard and what he knows now. [Katherine has a] lingering love for one of the brothers that we learn more about as episodes progress. She does love one of the brothers. Almost like Elena has chosen, Katherine has chosen and we see that unfold. FLASHBACKS TO A DARK TIME IN DAMON'S LIFE —- Stefan (Paul Wesley) continues to offer Katherine (Nina Dobrev) his support while trying to mask his own pain, until Caroline (Candice Accola) shows up with an unusual form of therapy. After trying to make amends with Caroline, Elena (Nina Dobrev) grows so concerned about Damon (Ian Somerhalder) that she turns to Aaron (guest star Shaun Sipos) for help. Later, when Damon tells Elena about a terrible ordeal in his past that he has kept secret for decades, she shares the disturbing information she just learned about her own family. Finally, Aaron decides on a desperate course of action after a conversation with Dr. Wes (guest star Rick Cosnett). Chris Grismer directed the episode written by Melinda Hsu Taylor (#509). NEW ALLIANCES ARE FORMED —-Marcel (Charles Michael Davis), deeply conflicted by recent events, is surprised when Klaus (Joseph Morgan) opens up to him about some of his past indiscretions. Cami (Leah Pipes) tries to make sense of cryptic messages she's come across and is disturbed when she gains some insight into Klaus' past. Meanwhile, in a surprising turn of events, the human faction takes matters into their own hands, resulting in a violent confrontation. Elsewhere, when Hayley (Phoebe Tonkin) learns of a plan to harm the werewolves in the bayou, she turns to Elijah (Daniel Gillies) and Rebekah (Claire Holt) for help. After heading to the bayou, they run into a werewolf named Eve (guest star Tasha Ames), who has information that leads them to a shocking discovery. Joshua Butler directed the episode written by Ashley Lyle and Bart Nickerson (#109). AN ANGEL WAR BEGINS —- After a massive angel slaughter occurs, Sam (Jared Padalecki) and Dean (Jensen Ackles) arrive at the scene to investigate and are surprised to run into Castiel (Misha Collins). While investigating, Castiel is captured and tortured. Meanwhile, Dean questions Ezekiel's demands and wonders if it might be time to tell Sam the truth. Thomas J. Wright directed the episode written by Eugenie Ross-Leming & Brad Buckner (909). 11/29/2013 (10:00PM - 11:00PM) (Friday) : Harker discovers that General Shaw is far from the heroic figure he presents to the public. Van Helsing's first attempt at infusing a vampiric test-subject with his solar-serum is a disaster. Lord Davenport's agents abduct and torture Renfield. Harker and Mina's engagement party sets a stage for betrayal and contretemps when a single dance between Mina and Grayson unveils their true feelings. A mysterious professor tries to help Freya regain her powers; Killian makes a decision about his future; Mike reveals a theory to Ingrid; Dash tries to solve the mystery of the catacombs. Episode 1.10 - Oh, What a World! Freya's wedding day arrives; both Killian and Dash give Freya wedding gifts; Joanna and Wendy discover the identity of the shifter; Mike takes dangerous measures to complete his plan.